Posted on August 14, 2013 | 8486 views | Topic : Featured, Property News. 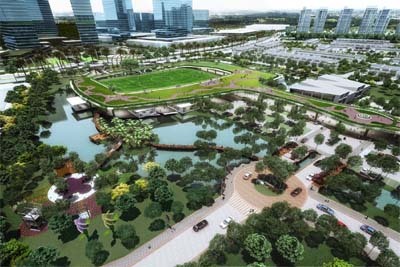 Artist’s impression of the Bandar Rimbayu township. All 339 non-Bumiputra units of the second phase of IJM Land’s Bandar Rimbayu leasehold township have been taken up even before sales were opened to the public. Most of these double storey terrace houses were sold by ballot early this month to potential buyers who had come for the balloting of Phase 1′s units but were unable to secure a unit. The balance units were sold yesterday (Aug 13) to those who had registered their interest for Phase 2. Dubbed Perrenia, Phase 2 comprises 484 homes with generous land sizes of 22′x80′ and 24′x80′. They were priced from RM642,000 and RM706,000 respectively (net of rebate). Interestingly, the early bird rebate offered was relatively modest–RM10,000–presumably given the hot demand for these early phases. Neither was a developer interest bearing scheme (DIBS) offered. Phase 3 is expected to launch by the end of the year. Located close to Kota Kemuning in southern Shah Alam, Bandar Rimbayu is a mixed township spread over 1,879 acres; the project was previously known as Canal City.